Tacking is a complicated process involving the whole crew. The difference between a good one and a bad one is hundreds of feet loss to weather, not including possible personnel or gear damage. 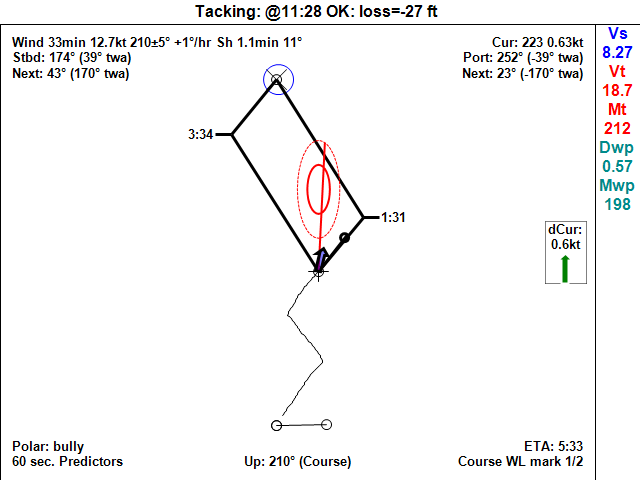 The bottom line is the distance you lose to weather (DLw) when you tack (see Tack Analysis). Only tack practice will improve performance and produce more consistent results. For effective training you need a tack score to decide whether your last tack was a good one. 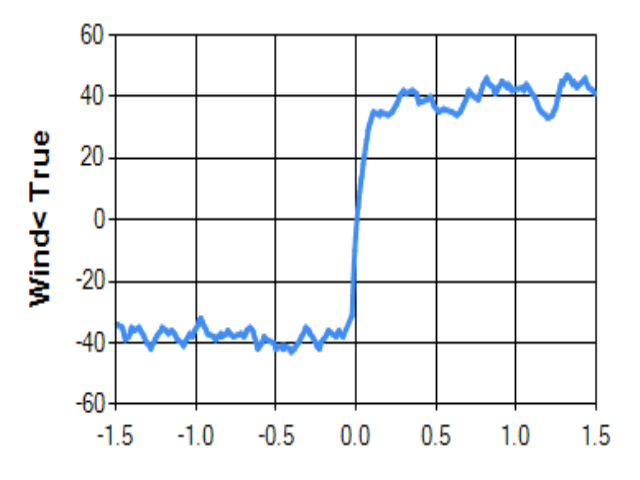 The profile; boatspeed loss, rate of turn, amount of ‘crack-off’ on the new tack. The length of the tack. The sea state (lump slows the boat down more) and wind speed (the driving force for acceleration). Turning fast gets you onto the new tack with more boatspeed (and therefore less acceleration to do), but your shoot will be less, and rudder drag will be higher. Turning slow is less drag, and you shoot to weather more, but the boat will be slower at (3), so you will have to accelrate more, and the loss area will be bigger. In calm seas, slow turns are better, and in lump, fast turns are better. How far you bear off relative to your final course. The further you bear off, the faster you accelerate, but the less Vmg you have during. Sail handling and helmsmanship. The crew needs to have the sails correctly trimmed when the boat arrives at the planned acceleration angle to the wind. As the boat accelerates, the sails and course need to be adjusted. 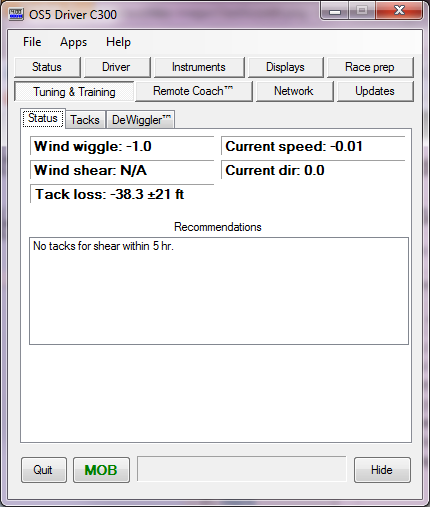 You can put up a graphic of many components of a tack (boatspeed, true wind angle, rudder etc.) on any graphical display so everybody can see how they screwed up. See Tack Tracker. 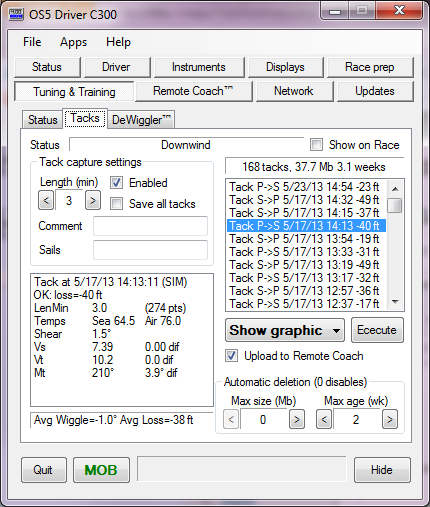 The driver Tuning/Status tab shows a summary of your recorded tacks, including your average sailing tack score. 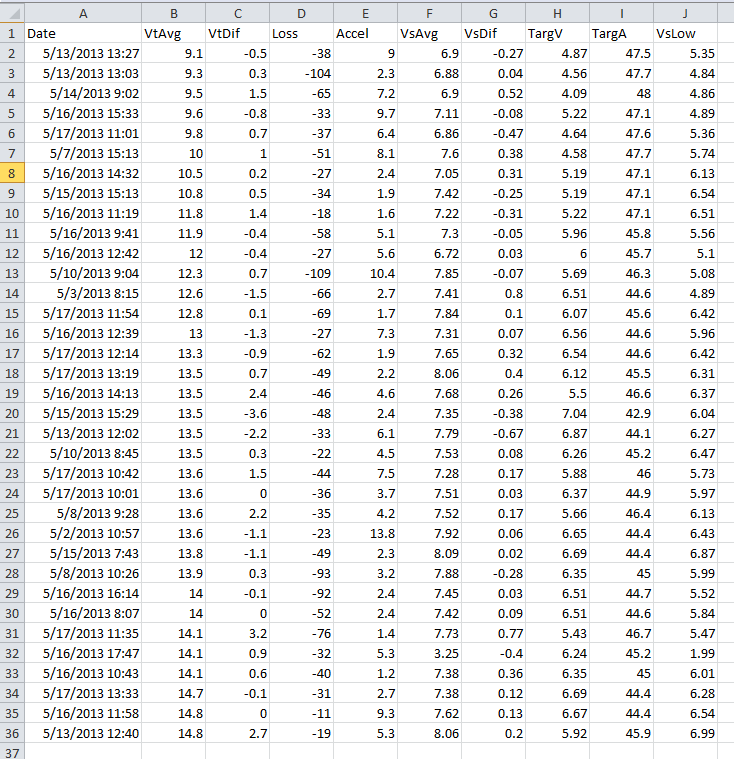 There is also a summary of wind and current wiggle for monitoring your calibration. The tacks tab lists all your saved tacks. Here we have selected a saved tack showing a sailing tack score of -27 feet in 19.3 knots of true wind. You can also export your tack summaries to a spreadsheet for detailed analysis.